The University of Tennessee Chattanooga’s campus now offers students, faculty, staff and alumni the Aquatic and Recreation Center (ARC), featuring a variety of ways to engage in daily exercise. The first phase of construction began in May 2007 and cost $16.5 million. Phase I included a gymnasium which houses two full indoor basketball courts that can be transformed into soccer courts, three volleyball courts, and badminton courts. New exercise equipment was included as well as an indoor track which wraps around the entire third floor and overlooks the gym. 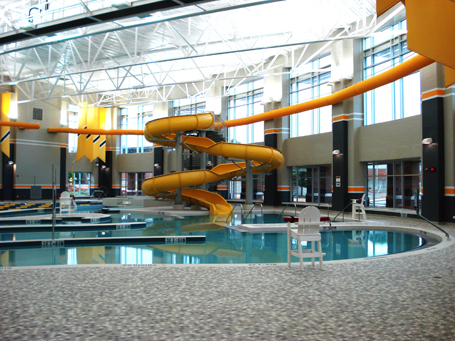 Completed in August 2011, Phase II included the addition of an indoor aquatic center. A whitewater theme plays off Chattanooga’s reputation as a destination for freshwater outdoor enthusiasts. Five lap lanes with depths ranging from 4 ft. to 10 ft.